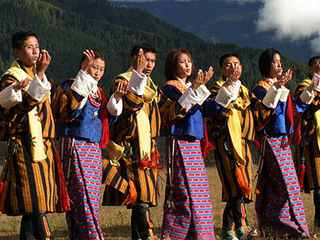 The Kingdom of Bhutan attracts visitors who love to explore unique cultural and natural landscapes. Your journey through the western part of this magical kingdom takes you to ancient temples, breathtaking mountain passes, enchanting trails through forests and small farming villages – all the while meeting the gracious Bhutanese people. 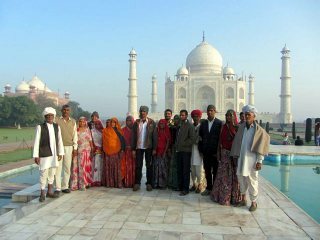 We believe that to travel responsibly, a portion of our tour cost should benefit the communities we visit. For this trip, our donation will go to a non-profit organization we support that is having a very positive impact around the world: DOCTORS WITHOUT BORDERS—a humanitarian-aid organization that provides ongoing emergency medical aid around the world. 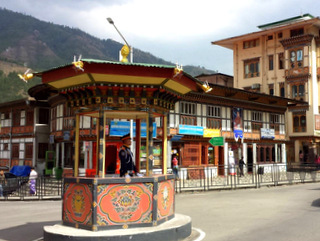 Arrive Paro and transfer to Thimphu, the nearby capital city of Bhutan. Enroute stop at the Palace of the Profound Meaning of Secret Mantras, the gateway to the Thimphu Valley. Afternoon visit to the National Memorial Chorten. 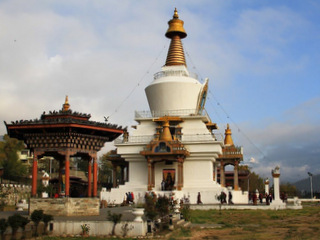 Built for the 3rd King of Bhutan, this white and gold stupa is dedicated to world peace and a popular place for locals and visitors alike to walk around the stupa, offering prayers and garnering good karma. Start the morning with a 1.5 hour hike through lush forest to the hillside Cheri Monastery, a premier Buddhist academic institution. Return to to Thimphu for lunch. Afternoon visit to Changangkha Lhakhand, which houses a protective deity of the Thimphu Valley inside the temple. Remainder of the afternoon free to explore Thimphu and if desired shop for handwoven textiles or paintings. Explore Buddha Dordenma, site of one of the largest statues of the Buddha in the world. Spend time at the local farmer’s market and an archery range to view the national sport. Afternoon visit to the Folk Heritage Museum, inside a 19th-century traditional Bhutanese house and filled with artifacts representing the traditional Bhutanese way of life. Finish the day at scenic Taschichho Dzong, set along the Wangchhu river and the current seat of the Bhutanese government. 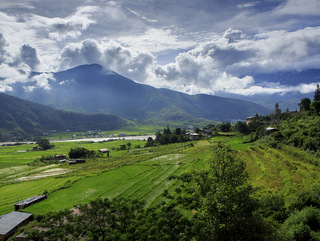 Depart for lush, semi-tropical Punakha Valley. Along the way, reach Dochula pass, a beautiful site that features 108 chortens (stupas) built by the Queen Mother for the security and well being of His Majesty, the King of Bhutan. On a clear day it’s a spectacular view of Himalayas. 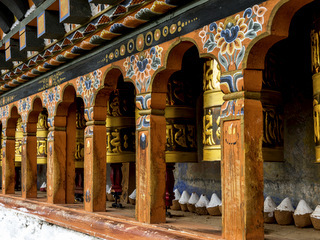 Continue your drive to Punakha, and a visit to Chimi Lhakhang—the Temple of the Devine Madman—whose unorthodox teaching methods included humor, bizarre behaviors, and sexual overtones. Arrive in Punakha, check into your hotel and relax before dinner. A morning hike takes you through traditional villages and farmland as you make your way from upper Punakha valley through the village of Kabjisa to Khamsum Yuelley Namgyel Stupa, overlooking Punakha Valley. Also built by the Queen Mother, the stupa is dedicated to world peace and stability. This afternoon visit majestic Punakha Dzong (the palace of great happiness), and the nunnery of Sangchhen Dorji Lhuendrup Lhakhang – perched on a ridge overlooking the Punakha Valley. The temple complex provides life skill training such as tailoring, embroidery and painting for the nuns who live here. Return to Paro with a stop for lunch on the way. Upon arrival visit Ta Dzong, the Bhutanese National Museum, which holds a fascinating collection of Bhutanse art, including bronze statuary and paintings. Walk down the trail to visit Rinpung Dzong, also known as “Fortress of the Heap of Jewels”, noted for it’s stunning architecture and setting beside the Paro river. 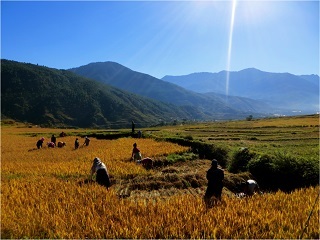 This morning, hike to Dop Shari village, where you will learn more about Bhutanese life. Visit a Bhutanese farm house—these very colorful structures follow the same architectural pattern, are highly decorative and traditionally built without the use of any nails. Return to Paro and a visit to the ruins of Drukgyel Dzong. 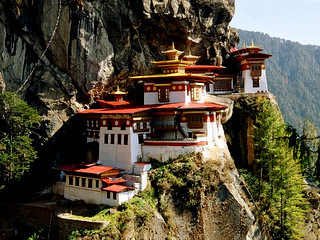 Get up early for the highlight of any visit to Bhutan—the hike up to the iconic Tiger’s Nest monastery. 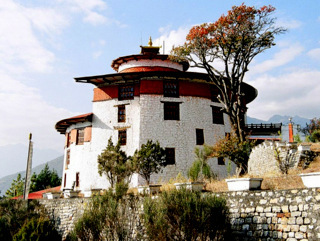 Built in 1692 around the sacred ‘tiger’s lair’ caves where Guru Padmasambhava is said to have meditated for three years, three months, three weeks, and three hours in the 8th century. Enjoy the spectacular views from the trail up to the monastery. Lunch after the hike in Paro. Afternoon to explore the many interesting shops in Paro, relax at the hotel or enjoy a cup of tea in a local café. Say goodbye to the people of Bhutan. Transfer to the airport for your flight to Delhi and onward home. Extend your stay in Bhutan with a trip to Bumthang or India with a trip to the historic Golden Triangle. Ask us about visiting Bhutan during one of the many colorful Buddhist Festivals.